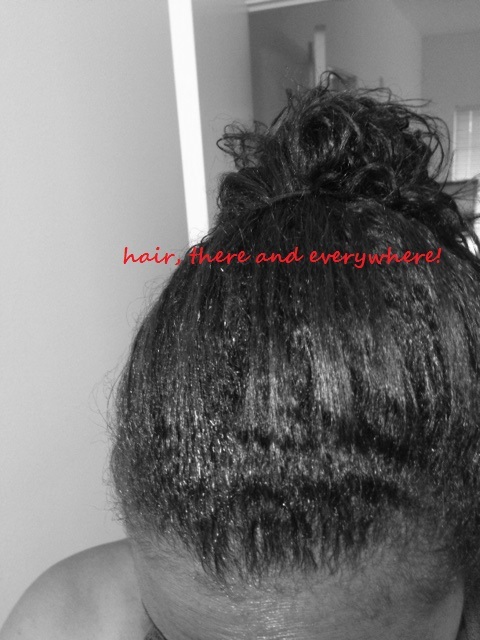 pre relaxer wash day | hair, there and everywhere! Pre-Relaxer Wash Day: Why Can’t These Ever Go Right? This is the fourth and final Pre-Relaxer Wash Day of 2013! 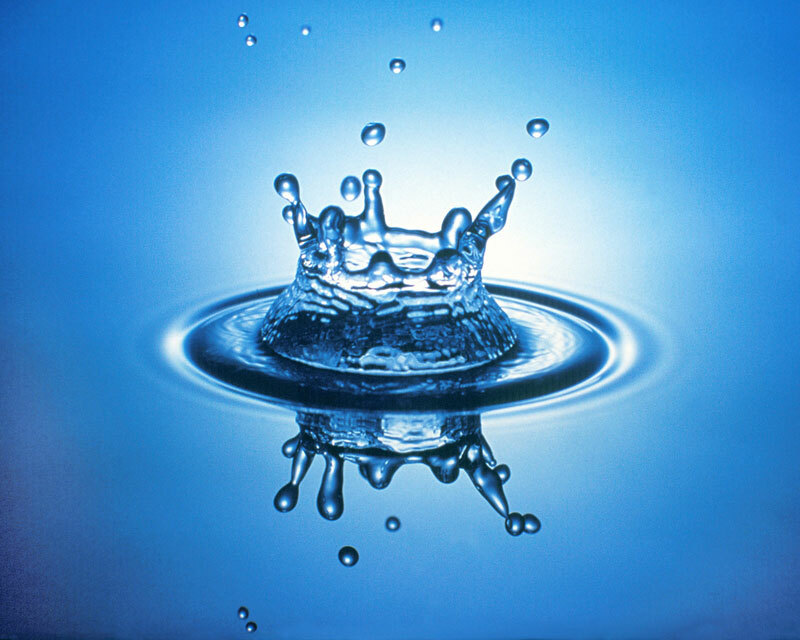 You know this is the time when I: Clean, Strengthen and Hydrate! Unfortunately, these Pre-Relaxer Wash Days have not gone right all year! In February, my hair was so tangled and matted after deep conditioning that I had to spend 35 painful minutes detangling it. In May, the end result of my hair was so oily after deep conditioning with hemp seed oil that it came out limp and gross. In August, I was just so frustrated with my hair not cooperating during roller setting that I blew it dry without flat ironing, only to have it become brittle and break by the time relaxer day rolled around. To keep with tradition, today’s Wash Day wasn’t that great either, but it definitely was the best I’ve had all year (which is not saying much at all). I was going to do my relaxer application practice, but it was a total failure. 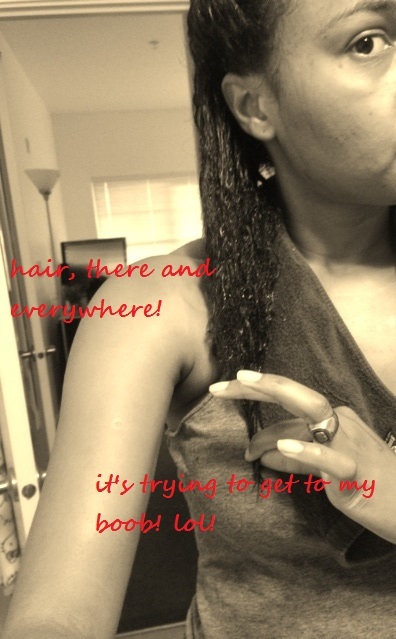 My hair was wayyyyyyy too curly and I would have had to tear through it just to apply it! No bueno!!!! 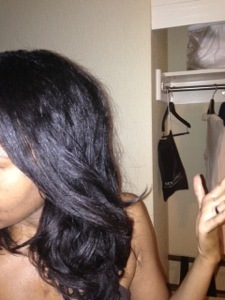 No wonder Kim threatened me about coming for a relaxer after air-drying the week before! I just pre-pooed with the V-05 conditioner I was using for practice for about an hour without heat. All week, I have been wearing my twist out which didn’t fall below my shoulders, so I wanted to stretch the hair out before I hopped in the shower and washed it. Clean – I clarified my hair with my Alterna Life Solutions Clarifying Shampoo, followed by my Alterna Caviar Volume for moisture replenishment. Both of these shampoos are sulfate free. Strengthen – I did my ApHogee 2 Step Protein Treatment. Since I abhor their conditioner that they include with it, I just bought the bottle of the protein treatment to use with my own deep conditioner. I applied the treatment and sat under the dryer for 20 minutes while it hardened. 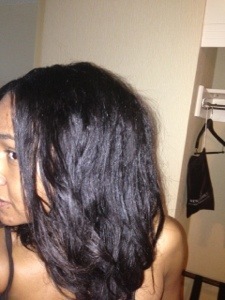 I then rinsed it out with warm water and applied my Ion Extreme Moisture Cream for 30 seconds to soften the hair. 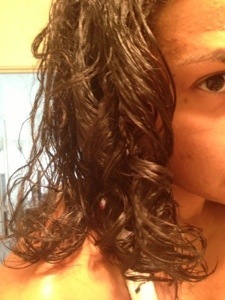 Hydrate – I applied my Silk Elements MegaSilk deep conditioner for an hour (45 minutes with heat). I rinsed, followed up with Roux for 1 minute, then rinsed again. This weekend, I knew that I needed a finished style because I am going to be filming some hair tutorials for a project at work (additional details coming soon!) on Monday, so I decided to roller set. 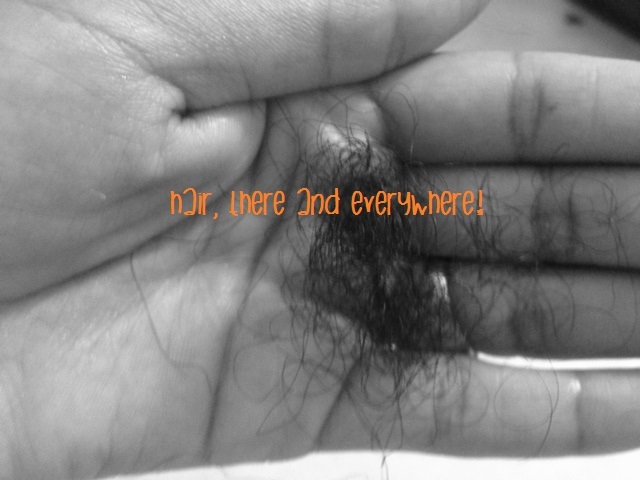 I detangled as normal after applying my leave-ins (the usual ones I use for rollersetting except the Carol’s Daughter Monoi Anti-Breakage Repair Spray since I had done a hard protein tx) and noticed that I was losing a lot of hair in the comb. I noticed a band of strands that came out in the shower, but I chalked it up to me doing zero manipulation to my hair the past week. Even as I used the rattail comb to smooth sections out before rolling, I noticed that I had to clean out the comb after each section of my mohawk because it was full of hair! You know I was almost in a panic! It could be a few things: my hormones (I had to go back to my old birth control pill due to the new one breaking me out and I also starting using progesterone cream to help with menstrual migraines), the weather (I had excessive shedding in December of last year) and like I said, no manipulation in the past week. I have had relatively little shedding the past 2 months, so who knows? I will definitely be monitoring it throughout the week and if it is still going on, I will defer my relaxer until its under control. I rolled my hair as usual, using the black and gray rollers. I wanted to have had a decent styling session this Pre-Relaxer Wash Day, so I took my time rolling my hair and practiced some much-needed patience. When my hair didn’t want to cooperate or the rollers were not placed right, I calmly corrected it. It took me just under an hour to roll my hair today, which is about 10-12 minutes longer than normal. I also added diluted Lotta Body back into my regimen. During previous Wash Days, I noticed as soon as I comb my curls, they just go straight and flat. I think it was because I used too much moisture while rolling (my leave-ins in addition to my setting mix of glycerin and water) and had no setting lotion. Kim told me that I needed to use some, but I wouldn’t hear it! After all, Gennifer in the roller setting video only used water to set her hair, so that’s what I would do … until I got tired of my hair not holding a curl after spending all day on it! Also, setting lotion helps hair dry faster. I sprayed every section of hair to be rolled with diluted Lotta Body (not sure of the ratio … but it was definitely a lighter blue color). Well, the Lotta Body helped me have crisper curls, but didn’t really cut down on drying time. I was almost dry at 90 minutes, but I stayed under the dryer for just over 2 hours so I could be sure I was dry. Besides, I was reading a good book which makes dryer time more bearable! I took my hair down and applied a bit of Carol’s Daughter Monoi serum to the curls! The curls felt like they had more staying power than curls of prior weeks, but I couldn’t help that my hair felt thinner due to the amount of hair I lost (see below). 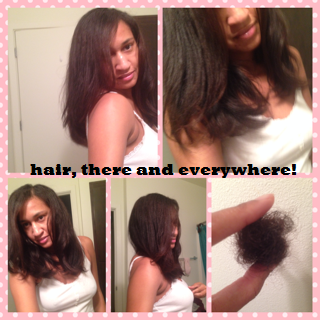 I combed the curls out and wow … my hair retained some bend (see photos)! It definitely was a roller setting success! Now I know that I need some setting product in my life! I continued to pull shed hairs down my hemline that hadn’t quite released themselves yet, which annoyed me, but whatevs. I then wrapped my hair up for the evening! I will capture some “next day hair” photos tomorrow or Monday! These are the curls as soon as I took them out. Most of my hair was rolled on black rollers. 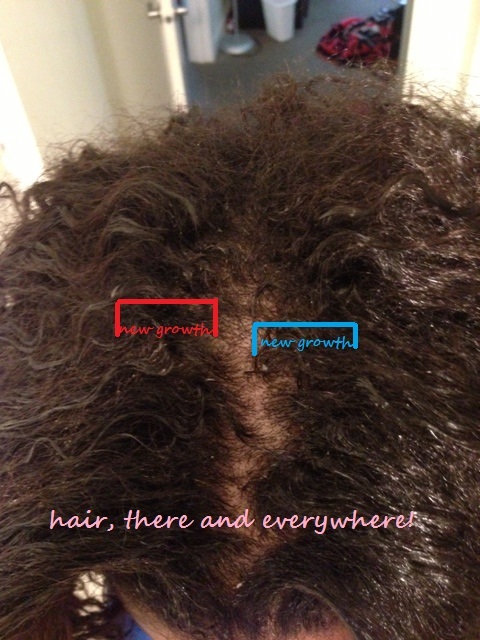 I also took a close-up of my ends, as I was very pleased with how they are holding up this relaxer stretch. Hair combed out! A success! Hair still has bend at the ends! Also, notice that ball of yarn hair!!! That doesn’t include the countless stragglers that came out afterwards or in the shower! Today is my last Wash Day before my relaxer! Now, normally I would just let my hair air dry to reduce the amount of manipulation that I had to do as my finishing style, but I made a promise to Kim during my relaxer that I would never come back to her with my hair a tangled mess again!! Besides, I have a conference that I am attending, so I thought a roller set would be appropriate. 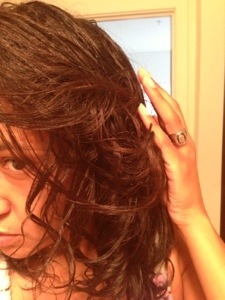 I began Wash Day by clarifying my hair with my Alterna Life Clarifying shampoo. This will remove all the product build-up in my hair and leave me with a clean palate in which to do my Pre-Relaxer regimen. I washed 2x. Clarifying my hair often leaves my hair feeling stripped and dry, so I always following up with a moisturizing shampoo, with my favorite being Alterna Caviar Moisture. 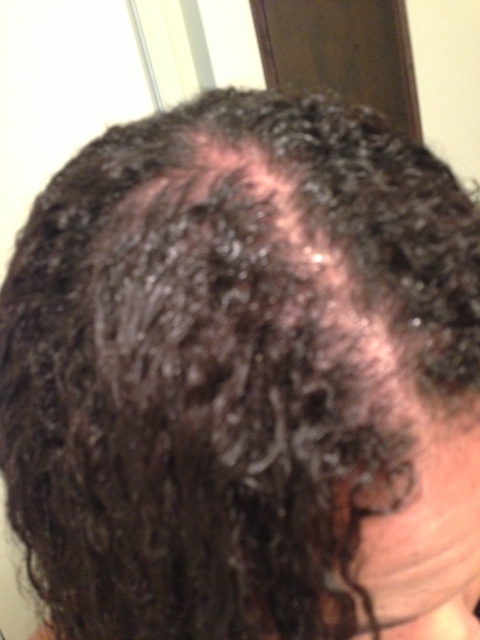 I followed up my shampoo session with an in-shower black tea rinse to see if it would help with shedding. To be honest, I have not been experiencing bad shedding for the past month, but since I love how strong my hair feels after a tea rinse, I decided to do it anyway! 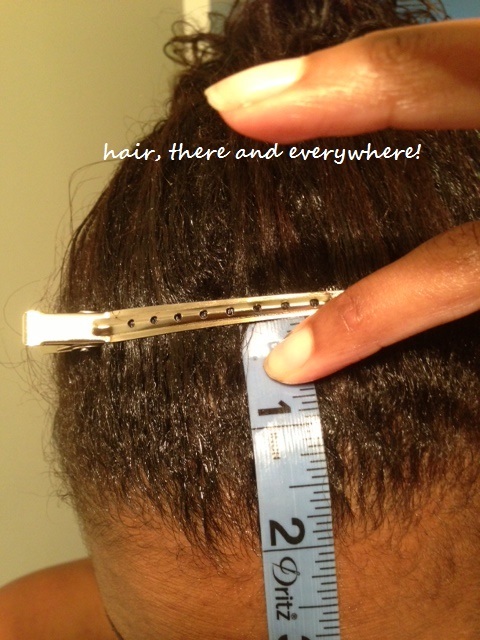 I applied the tea rinse to my scalp with a nozzled bottle and applied to the length of my hair. I left on for about 5 minutes and rinsed. Despite feeling strong, my hair also felt a bit dry, so I decided to detangle in the shower with my Redken All Soft. Another reason I detangled was because during my last hard protein treatment before February’s relaxer, I just applied the ApHogee 2 step protein treatment on my hair without doing so. 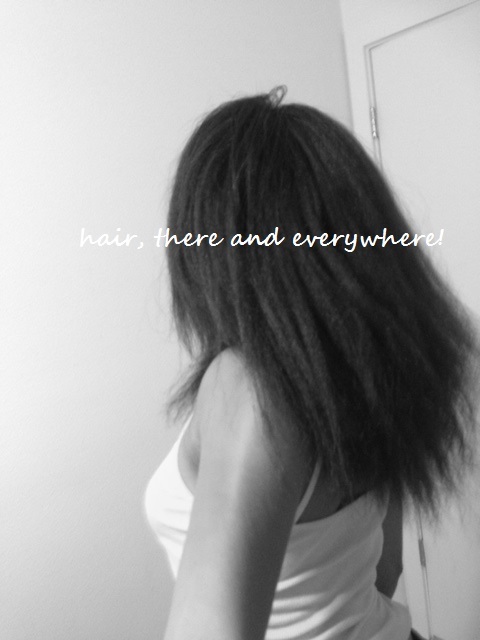 When I went to detangle my hair after the deep conditioner, it was a horrible, matted mess. It took me 30 minutes to detangle my hair and that resulted in broken hairs. NEVER AGAIN! I thought, WILL I EVER APPLY THE APHOGEE 2 STEP WITHOUT DETANGLING!!!!! I rinsed the conditioner from my hair, stepped out of the shower and applied the ApHogee 2 step protein treatment, making sure to give extra care to the ends of my hair and the line of demarcation between new growth and relaxed hair. Now here’s my thoughts on this product, if you care to hear. The protein treatment stuff smells pretty bad and is messier and stickier than a mug. I often smell it for a few days if I don’t clean my rugs, floors and any rags that I wipe up my sink with. It’s a great treatment, as I remember using it way back in the day (like 1996). Despite me not feeling that I need such a strong protein treatment, I like to use it every pre-relaxer day as I feel it gives my hair a fighting chance with goes up against relaxers and people who may not care about my hair the way I do! 😉 So, despite me not liking the smell or the mess, it is something that I deal with 4xs a year to give my hair some added strength heading into a relaxer session. As required, I sat under the dryer until my hair hardened (which was 15 minutes) and then stepped into the shower to rinse out. A must following any protein treatment, it was time for me to hydrate my hair and bring it back to balance after the hard protein. 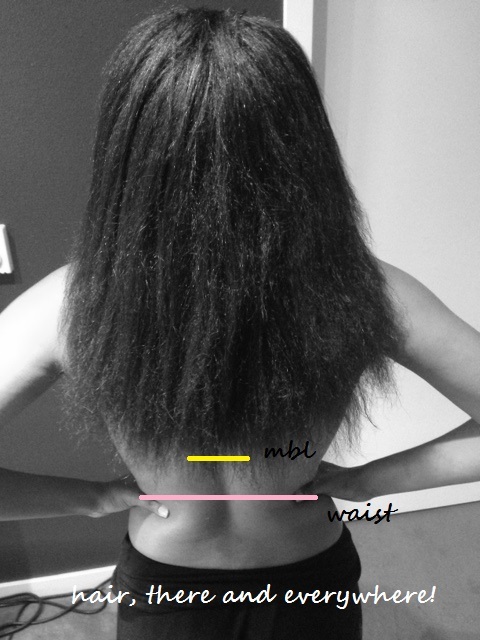 Since I do not pre-poo before clarifying (it just seems to be moot, in my opinion), I decided to incorporate a hot oil treatment into my deep conditioning session. Still eager to try the safflower and hemp seed oils, I mixed them in a bowl and heated them for 15 seconds to get them warm. Since all of my nozzled bottles are currently occupied (which is how I normally apply my oils during hot oil treatments), I decided to do it the old-fashioned way — by hand! I parted my hair into six parts, detangled (WHICH WAS A BREEZE!!! 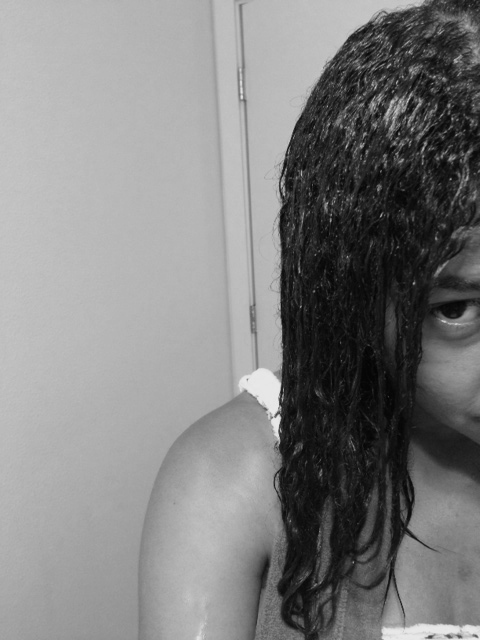 ), applied the oil mixture to my scalp and along the length of my hair. 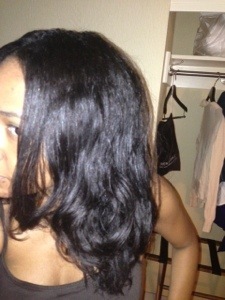 I also applied my MegaSilk deep conditioner to the length of my hair. After my whole head and length were done, I put the left over oils on the length of my hair … for good measure! I sat under the dryer for 30 minutes, which is shorter than my normal time of 45-60 minutes. I rinsed, applied Roux for 2 minutes, then rinsed in cool water. By this time, I should note, my bathroom looks a *in Madea’s voice* DAMN MESS! The floor has been “hydrated” with my repeated entry and exit from the tub because I forgot something, towels are thrown askew and there are random product droplets all on my counter. That’s why Wash Day is synonymous with Cleaning Day for my bathroom! 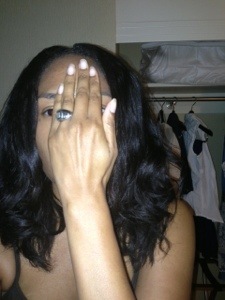 I must say that my hair felt heavenly after the deep conditioner! 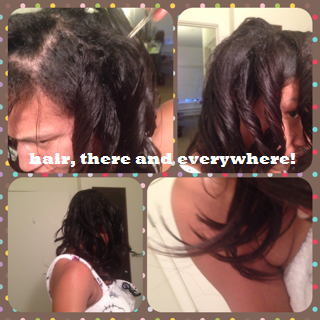 Parting and detangling were a breeze and in some spots, my hair felt like butter it was so soft!!! I am looking forward to using these two oils again!! I will play around with them upon my return and see how they can fix in other parts of my regimen (e.g. M&Sing). Well, I am just spent … from start to finish, today’s Wash Day will be almost 5 hrs!! It’s already 3:30pm and I have about another hour to go under the dryer. It wouldn’t be so bad if I didn’t have to be in the bed by 8:30pm, as I have a 6am flight tomorrow!! 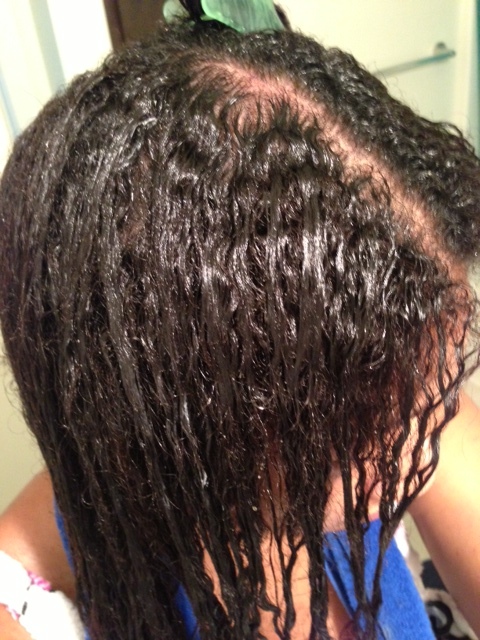 I will try to post some pics of the finished product, but if I don’t … don’t worry … relaxer pics will be coming soon!!! Update: After I took my rollers down, my hair was so oily!! 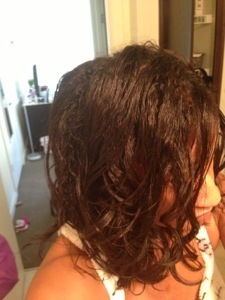 There were parts of my hair that even looked wet, it was so oily. I have included a couple of pictures. I think I may have been too heavy-handed with the safflower and hemp seed oils and also I think that the mixture was a bit heavy for my fine strands. 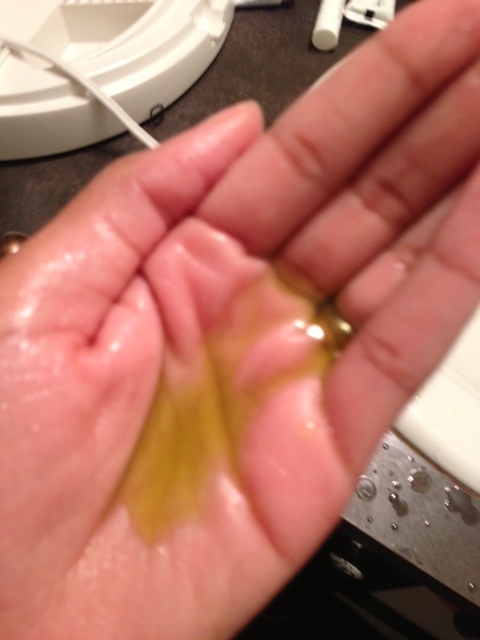 Next time, I will use less oil and use it as a pre-poo so that I have a chance to wash it out instead of just rinsing. I plan on using some dry shampoo to absorb some of this oil when I style it in the morning. Also, I need a new hair dryer. I was trying to hold out, but my old tabletop isn’t cutting it anymore. There aren’t many vents in the back, so I end up having a dry top and wet back area! No thanks. I will be shopping for one upon my return from NC next week. Eew!! Look at that sogginess!!! Update: When I awoke that morning, I applied some Kenra Dry Shampoo and combed throughout my hair. I clipped it up and headed out the door. When I arrived in Baltimore, I had some white residue in my hair, so I applied some Alterna Caviar White Truffle Elixir and combed my hair … it came out nice … until the humidity hit it! It was Bun City after that evening, but hey, now I know I can recover if I use too much oil on my hair! 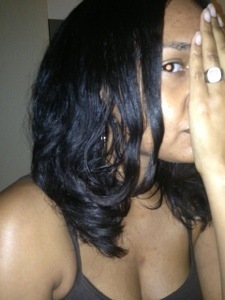 Excuse face-covered shots … I didn’t feel I was “proper” enough for the camera!